Most men are at a loss when it comes to controlling facial hair, especially when it comes to the ears and the nose. As men age, larger quantities of facial hair tend to appear in places that were never a problem before. Unwanted and unsightly strands of hair appear, and if you’re like most men, you would want to know how to deal with it. Needless to say, grooming is a very important aspect of maintaining proper personal appearance. This is why it’s also important to be equipped with the right grooming tools, such as a good Nose Trimmer. In choosing the Nose Trimmer that’s right for you, it’s important to note that these tools usually come in a package. This means that the functionality of the Nose Trimmer should not just be limited to trimming unwanted hair from the nose. If you get something like the Panasonic ER430K, you get to groom hair not only in your nose but also in your ears and on your face. 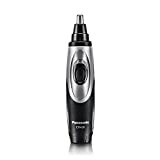 This Nose Trimmer comes with a vacuum system, which means you don’t have to worry about what to do with your hair clippings. The vacuum takes care of the cleaning up for you (sort of), and this easily solves one of the problems men have with grooming. For efficient hair grooming, the ER430K also comes with a Rotary Blade System complete with safety cone. The safety cone protects your skin from injury or the usual cuts. It achieves this by cleverly guiding the hair into the blade system and preventing direct contact. The blade system itself is constructed with stainless steel and high quality blades, so the sharpness will be long-lasting. The dual-edge blade is also curved and hypo-allergenic, so it cuts cleanly and safely. Even if you have individual stray hairs, and who among us doesn’t, you can really go into the details of shaping your beard and facial hair with this blade. This trimmer also comes with an ergonomic design which makes it easy to use. It fits in the hand perfectly, so holding it in position and using it to trim facial hair is no problem. It also operates on just 1 AA battery (good for 90 minutes), so it’s very portable and handy. For travelers, you even get a protective cover and a travel pouch with your purchase. The nose trimmer was designed to be fully immersed in water. This means you can apply running water to it anytime you want it cleaned. The portability and user-friendliness of the ER430K is one of its biggest advantages because you’re not left with a product that you don’t know how to use. You don’t even have to read through any user manual—it’s THAT easy to use. In terms of efficiency, you get what you need with this Nose Trimmer, especially because it cleans up after itself…as much as a device can. You don’t have to collect the cut hairs because the vacuum system will do the job for you. No chance of itching or sneezing here. Painless hair removal is a blessing to all of us. Expect far fewer tear-soaked eyes from hair tugging and pulling with this device. The ER430K renders the process of hair removal painless. Panasonic has really thought this product through, so it’s difficult to produce too many drawbacks. The 90-minute battery life is already pretty impressive, but perhaps a minor drawback is that when you run out of battery, you better make sure you have a spare. You also need to be aware that the ER430K heats up quickly. This is not so much of a drawback, but it does catch a few people by surprise. In terms of price, it’s also a step up from your usual trimmer or blade, but with all of these features, you’ll just have to decide if it’s worth the few extra bucks. In most cases, it is. With customer ratings alone, this product already comes with a high rating. That’s pretty high for a product that has many alternatives. Customers are loving the built-in cleaning vacuum feature, the efficiency of the trimmer, the ability to use it on all hairy facial bits, and the fact that there is no awkwardness in holding the device which fits neatly within the hand. Given that some other trimmers can cause painful pulling on application, the ER430K is largely confirmed to be as gentle as it claims, giving rise to grateful accolades that the product actually works! Should You Buy the ER430K Trimmer? The ER430K by Panasonic is a worthy candidate for purchase among the myriad of nose trimmer products currently on the market. Find Out The Best Prices On the Panasonic ER430K Trimmer Here. For a product that offers an ergonomic design for ease of handling, loose trim control vacuum cleaning functionality and minimal blade to skin allergy irritation, the ER430K is not so much a gadget, but rather a device that commands definite attention and consideration from the ‘man in the mirror’.